Because he reminded me of me. More than anyone else in the Bible, I saw in him someone whose pattern of actions I recognized in an intimate way. Of course I’d heard his name before and at least knew that he was somehow involved in Jesus’ crucifixion, but I’d always pictured him to be just “the bad guy, ” depicted as a flatly evil cardboard character. But as I read of his back and forths with the crowds, saw the hesitation in his words even 2, 000 after they were spoken, I realized that he was a much different person than I’d imagined. I realized that the motives for his choices were complicated, disturbing…and familiar. You shift the blame. You make the discomfort of doing the wrong thing comfortable again by telling yourself that you are not wrong at all. You focus on your external circumstances, listening to the noise of the crowd instead of your own inner thoughts, pointing the finger always away from and never toward yourself. But why? What is so alluring as to make a person act in such a dishonest, cowardly way? I knew that the threat of losing favor with the Emperor would be more than a person like Pilate could take. I knew it would be the last straw, the spark to ignite the rationalizing and denial that would clear the way for proceeding with evil. I knew it because, at that moment, I recognized somewhere within myself my own disturbingly strong desire to be “friends with the Emperor.” My “Emperor” was something different than Pilate’s, of course: his was an actual man who had the power to make all Pilate’s wildest dreams of riches and success come true; mine was a symbolic Emperor comprised of all my desires for things like comfort and pleasure and money and control and success and acclaim, an Emperor whose friendship I sought over doing the right thing on at least a daily basis. At the time this was all somewhat vague for me. Without the knowledge I would eventually gain through Christianity, I didn’t have a lexicon for articulating the reality of things like temptation and sin and redemption. But what I see so clearly now is that the story of Pontius Pilate’s decisions up there before the crowds resonated so deeply with me because it is the story of rationalizing sin. It is the story of trying desperately to make it comfortable to do what you know to be the right thing, and giving up when you can’t. And, as I realized only later, Pilate’s all-to-familiar actions 2, 000 years ago are not as different in severity from mine as I might have liked to tell myself, because they both led directly to Jesus’ death on the Cross. Beautiful post Jen! Yet another reason why Pilate is the only sinner remembered in the 2,000 + old Creed. I grew up in a very different place than you – fundamentalism. So I always knew Pilate was a bad guy and I knew enough of the story to know why. But I can remember reading through it again when I was old enough to understand motivations and realizing that he was a coward, and that I could identify with him a lot. Great post. That is a beautiful post, and a great post to read and reflect on as we head into Lent. Deo Gratias for the way you process things and for your willingness to spill it out here for us to read and benefit from. You are a big help to me–in how you put such large ideas and feelings into such discrete morsels of explanation. Very true. That’s a large weight to bear, knowing that my failings alone would still have required Christ’s sacrifice to open heaven once again. Jen, thank you, again. I always look forward to your updates, and agree that if this was the “excess,” then wow…can’t imagine what is in this work of yours, and can’t wait to read it all. Keep going — you’re birthing a book and baby all at once. 🙂 In the end, what I take from this is what Teresa Tomeo said when she was in our city a couple weeks ago: the truth is written on our hearts, even when we don’t recognize it. Somehow you knew what was right even when you didn’t want to really face it, even when you couldn’t put it into words. Sharing the processing of all that these years later is the gift you are giving us. I’ve never commented but I wanted to let you know that this is my favorite of all your posts. I thought of Pilate a few weeks ago when the daily reading was Mark 6:14-29, the beheading of John the Baptist. Herod, unlike Pilate, was certainly not a good man, but even in his corrupted state we’re told, “yet he liked to listen to him.” Of course, he did – Truth, Goodness by definition are alluring, enticing. As I reflected on this, I thought of Pilate as well. They were so, so close. So close. It’s very sobering because if one takes an honest look at one’s spirtual life there are times when we’re simply admiring from a safe distance and not immersing ourselves in the Truth. I’ve enjoyed your blog for a few months now. Thanks for keeping it up. I’m with Jane M., and looking forward to the book. Ouch. It is true we all find ways to rationalize our sin. 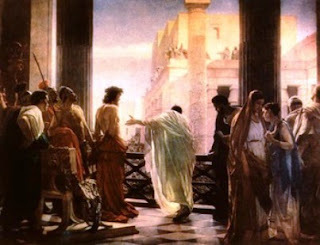 I’ve always felt sorry for Pilate, probably because I know the same temptation he faced. Every time that I have fallen in sin, it is because I thought that doing the right thing wouldn’t come with a price, that it would be easier. Doing the right thing is never painless. I have a new identification with Pilate now, too. How many times have I “crucified” my Christ, but tried to put the blame somewhere else. captured everything you mention in this post.. I really appreciated your post on Pontius Pilate. Although I never really thought of him as “the bad guy,” I used to believe that like so many other people he was just following orders. After all, he gave the people what they wanted after so much agonizing. It was only little by little that he gave way. I think many of us are like Pilate when we do things that we know aren’t right by following the crowd. I’ve done it so many times that I can’t count them. But I also think that we must be “counter-cultural” in order to be Catholics. We can’t just follow the world’s orders or be the emperor’s friends. We need to be God’s friends. Interestingly enough, the Ethiopian Orthodox Church canonized Pontius Pilate and his wife, Pulcheria. In some Eastern Rites, Pulcheria alone is a canonized saint. I want to thank you for writing this. I did some research a few years back and discovered that my lineage made me a relative of Pilate. I changed my last name. I always thought he was evil too and refused to tell anyone what I had discovered. Thank you Thank you Thank you. He’s not a bad man after all. Wow. I love this blog. What I see in Pilate (and in myself) is that he wanted to be liked. He would not lead, he just followed what the crowd wanted, to his own detriment. He was given signs and chances to do the right thing but he preferred to serve his need to be popular. Unreal. I don’t get to read this blog on a regular basis, but when I read posts like this, all I can do is stop and say wow. And go immediately to tell my wife what I just read. And then spend three straight days in contemplation. Your writing is such a mix of simple prose and profound thought that it is clearly inspired by the Holy Spirit. Could you please enlighten me on what you know about Saint Conrad of Piacenza. Today is his feast day and you mentioned him in one of your earlier posts. I love it. Thanks. If I weren’t writing this with just one thumb during a midnight feed, I would say more. Pilate, Pelosi, Biden, Sebellius, Kennedy…. At least Pilate didn’t pretend to be one of Jesus followers. So wonderful! Thank you for this post! ‘Zactly. Every politician who says “I’m personally opposed, but…” can no more wash his hands of the blood of the innocent than Pontius Pilate did. And as noted previously, if you’re self-editing writing like this out of the book — whoa! — this is gonna be some book. But trust your instincts. Too many authors don’t know what to leave out. They don’t seem to realize that sidetracks and redundancy don’t make for great reading.